Governor Cuomo is playing games with the homes and lives of more than 2.5 million tenants, writes Ginia Bellafante in the NY Times. 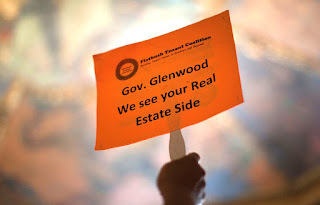 The disenchanted hung banners around the capital designating Mr. Cuomo “Governor Glenwood,” a reference to the real estate empire that has poured millions into state politics and reaped the benefits of a tax program — the controversial 421-a — also set to expire on Monday in the absence of an extension. . . . . “Moving the threshold a few hundred dollars isn’t going to help us at all,” Delsenia Glover, campaign manager for the Alliance for Tenant Power, said. In 2011, even as the threshold was raised $500 to $2,500, she said, 35,000 units vanished from regulatory control. And since then, rents have only grown in New York.